SCOTTSDALE, AZ--(Marketwired - April 01, 2016) - Lattice Biologics Ltd. (TSX VENTURE: LBL) (OTCBB: BLVKF) ("Lattice Biologics" or the "Company") is pleased to announce that is has closed the first tranche of the non-brokered private placement of special warrants of the Company (the "Special Warrants") announced on March 18, 2016 (the "Offering"). The Company issued 1,326,258 Special Warrants at a price of CDN$0.30 per Special Warrant, representing aggregate gross proceeds of USD $300,000. The net proceeds from the Offering will be used for working capital and general corporate purposes. Each Special Warrant will automatically convert, without payment of additional consideration and without further action on the part of the subscriber, into Units on May 2, 2016. Each "Unit" consists of one common share in the capital stock of the Company and one-half of one non-transferable common share purchase warrant of the Company (a "Warrant"). Each whole Warrant is exercisable into an additional common share at a price of CDN$0.30 per share for a period of 36 months from the date of closing of the Offering. The Company has the right to increase the size of the Offering without providing further notice to subscribers. Upon the conversion of the Special Warrants into Units, the Special Warrants will be automatically cancelled and will have no further force or effect. The Special Warrants are non-transferable. The Special Warrants and the common shares and Warrants comprising the Units to be issued upon conversion of the Special Warrants and any common shares issuable upon exercise of the Warrants will be subject to a hold period expiring on August 1, 2016. Lattice Biologics has received conditional approval from the TSX Venture Exchange for the Offering. This development provides additional forward momentum for the Company's ongoing efforts to strengthen its balance sheet. This release comes on the heels of the news that Lattice Biologics and the esteemed Sunnybrook Research Institute have partnered to commence a study to develop new cancer screening methods for personalized diagnostics (announced on March 30, 2016). Lattice Biologics maintains headquarters, laboratory and manufacturing facilities in Scottsdale, Arizona as well as offices in Toronto Ontario. The facility includes ISO Class 1000 and ISO Class 100 clean rooms, and specialized equipment capable of crafting traditional allografts and precision specialty allografts for various clinical applications. The Lattice Biologics organization includes a product development and scientific research team of Ph.D.'s, highly trained tissue bank specialists, surgical technicians, certified sterile processing and distribution technicians, and CNC operators who maintain the highest standards of aseptic technique throughout each step of the manufacturing process. From donor acceptance to the final packaging and distribution of finished allografts, Lattice is committed to maintaining the highest standards of allograft quality, innovation, and customer satisfaction. This news release may include forward-looking statements that are subject to risks and uncertainties. All statements herein, other than statements of historical fact, are to be considered forward looking. Generally, forward-looking information can be identified by the use of forward-looking terminology such as "continuing", "intends" or variations of such words and phrases or statements that certain actions, events or results "will" occur. Forward-looking statements are based on the opinions and estimates of management as of the date such statements are made and they are subject to known and unknown risks, uncertainties and other factors that may cause the actual results, level of activity, performance or achievements of Lattice Biologics to be materially different from those expressed by such forward-looking statements or forward-looking information. Although Lattice Biologics believes the expectations expressed in such forward-looking statements are based on reasonable assumptions, such statements are not guarantees of future performance and actual results or developments may differ materially from those in forward-looking statements. Factors that could cause actual results to differ materially from those in forward-looking statements include market prices, continued availability of capital and financing, and general economic, market or business conditions. There can be no assurances that such statements will prove accurate and, therefore, readers are advised to rely on their own evaluation of such uncertainties. We do not assume any obligation to update any forward-looking statements except as required under the applicable laws. 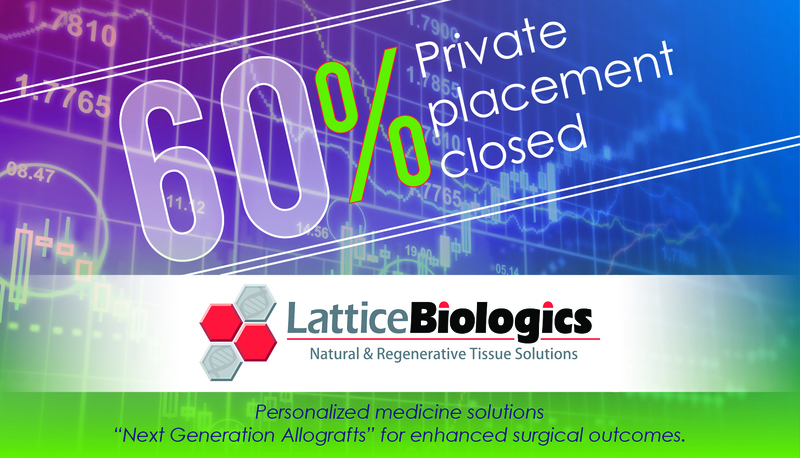 Lattice Biologics closes 60% of its recently announced private placement.